For the average consumer, when a television or computer monitor dies, the excitement of purchasing a shiny new unit often eclipses any curiosity over where the old device goes. Those screens have to go somewhere though, and people can't just throw them out in the garbage. Most of the time owners drop off their old TVs at various electronic stores and don't give it another thought. This is the start of a large process where these dropped-off devices often end up being recycled. Modern flat screens made of panel glass have been on the market for nearly two decades and are very different technology from tube televisions containing cathode ray tubes, CRTs, made of leaded “funnel glass.” A CRT is a vacuum-sealed tube made entirely of funnel glass, ending in a florescent screen with one or more electron guns on the narrow end. Containing a high level of lead, funnel glass is less fragile and is intended to protect consumers from harmful X-rays emitted by the electron guns while the television is on. Recycling CRTs can create harmful, fugitive dust at various points in the process. 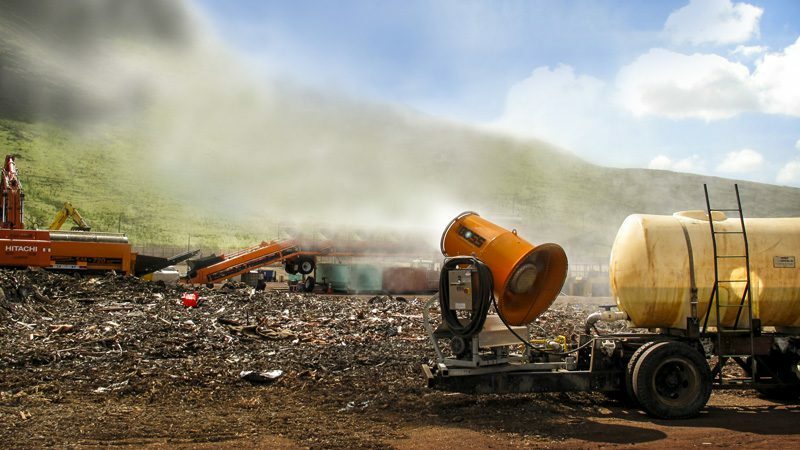 It is necessary to take steps towards creating a safe work environment by practicing the correct recycling process and implementing dust control methods optimal for the jobsite. In the recycling process, television sets and monitors are delivered whole or in pieces to facilities, where the recyclables are immediately loaded into a hammer mill to crush the debris. The resulting scrap is then conveyed through a separation process, in which metal is discharged by magnet and plastic is removed. What’s left is crushed leaded funnel glass and inert panel glass. Unlike funnel glass, panel glass breaks into beads, which makes it easy to screen out before the two types of glass are transferred to an observation conveyor. There, workers closely inspect the size and quality of the end product. Once deemed adequate for transport, the funnel glass is transferred to a loading conveyor and dropped through one of two tall spouts into a steel transport container with a liner, which is tightly sealed before it leaves the plant. After one container is full, the conveyor is switched to the second spout, so there is no break in loading. The product is then transported by truck to a partner facility where de-leading renders it inert. In addition to requiring protective gear to avoid lead exposure, companies wish to further reduce potential worker exposure by addressing all sources of airborne dust. The DustBoss® Ring (DB-R) is a stainless steel ring manifold fitted with atomized misting nozzles. The nozzles produce millions of tiny water droplets just slightly larger than the diameter of a single human hair. The mist flows out of the ring much like a curtain drawn around the discharge, trapping fugitive particles and directing them back into the transport container using BossTek’s Variable Particle Sizing approach, matching droplet size to dust particle size for maximum suppression. Rather than just saturating surface material like a high flow sprinkler system, VPS matches the size of the droplets to that of the fugitive particles. Every substance - from funnel glass to coal - produces different sized particles based on its individual characteristics and the method of processing. To achieve optimum effectiveness, droplets and dust must be roughly the same size, inducing the maximum number of collisions with the particles and pulling them to the ground. Droplets that are too large create a “slipstream effect,” in which air travels rapidly around the droplet as it falls, causing smaller particles to get caught within the air stream and deflected around the droplet, rather than being absorbed. For example, according to the National Institute of Environmental Health Services (NIEHS)1, particles are visible at around 50 microns, inhalable up to 100 microns and tend to linger in the air at sizes of up to 200 microns. Standard flat head industrial sprinkler systems produce rain-like droplets between 200 and 1000 microns in size,1 which are far too large to capture smaller particles. The water saturates surface material, but does not address particles that are already airborne. A low-volume atomized mist unit produces droplets between 50 and 200 microns in size -- creating a larger percentage in the low size range, while using less water. After following the material flow into the container, the mist settles, suppressing surface dust as well. Flow rate is important in this application, because the volume of water may increase the container weight and change the consistency of the delivered material, potentially affecting transport costs and subsequent processing. Staff, "Particles: Size Makes All the Difference", National Institute of Environmental Health Services. Research Triangle Park, NC, 2006. Want to Clear the air? Ask the boss! 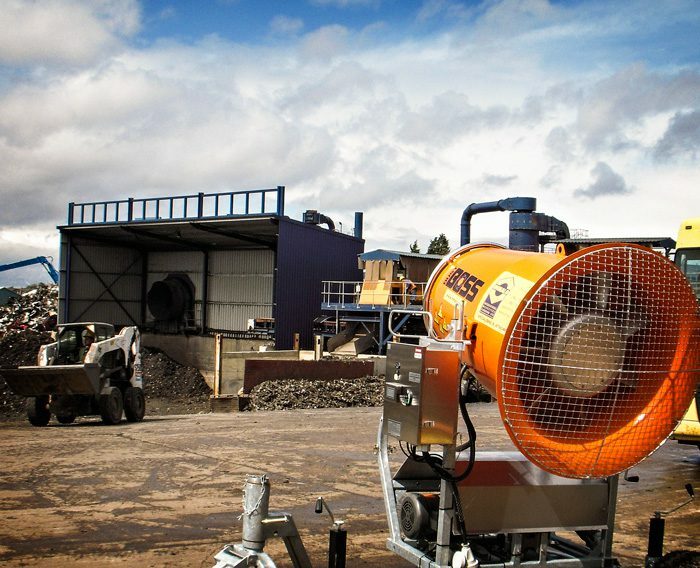 Let us provide you peace of mind with the most durable dust control solutions on the market! Call us today for a free quote! This entry was posted in Blog, DB-R, DustBoss, News, Recycling / Scrap, Uncategorized. Bookmark the permalink. Both comments and trackbacks are currently closed.